Good news: you no longer have to visit a fortune teller or hack into Mode 7's brains to learn the release date of their turn-based tactical sports game Frozen Cortex, as they've just announced that's it's coming Thursday 19th February. Hey, that's next week! News this exciting should be accompanied by a trailer featuring some new game footage and a bit where one of the developers larks around in a field before zooming in on a cat. Such a thing is located above, thank goodness. 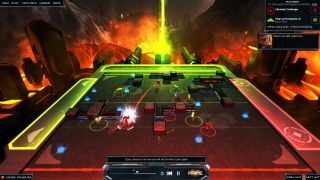 Frozen Cortex recently received a giant single-player update, and I'd imagine it'll be getting a similarly sizeable update next Thursday, when Valve's Early Access Marshall bangs the big release gong that turns unfinished games into complete ones. Theoretically, at any rate.